Many Nevada residents have heard of the legal concept of product liability, but many do not realize exactly how broadly product liability law applies to the products and goods they use in their everyday lives. The premise of product liability under N.R.S Section 695E.090 is that if a consumer purchases a product and that product is defective and does not work as it is supposed to, or the product is designed in such a way that it exposes consumers to a substantial risk of harm or actual harm, the manufacturer, designer, and seller of the product can be held liable for the personal injuries caused by the product. What are Common Types of Product Liability Cases? Defective automotive parts: Recalls of defective automotive parts are something you hear about a lot in the news today. The defective product might be important to driver safety, such as a defective airbag, a defective steering or braking system, or a defective navigation system. Defective tires are also common defective automotive parts. Dangerous toy:. It is unfortunate when a child is injured by a dangerous or defective toy. Kids should be able to play with their toys without risk of injury. Defective medical devices: Many medical devices are important for saving lives and improving the overall health of patients. But from time to time a medical device could be defective in its design or manufacture, which causes harm to patients. Dangerous drugs: Sometimes drugs are sold to consumers that have undocumented or understated adverse side effects or dangerous interactions with other drugs. When consumers take dangerous or unsafe drugs, they can end up seriously injured. Contaminated food products: Consumers expect their food to be safe and free from dangerous contaminants. However, instances of contaminated food products are often reported on the news. Contaminants can range from pieces of glass or metal to dangerous bacteria that can make consumers sick. Faulty or defective appliances: Consumers interact with home appliances large and small every single day. When a curling iron is designed to get too hot, or a dishwasher poses a risk of catching on fire, the appliance may be defective or faulty. If you have been injured by a defective or faulty product, it is important for you to get into touch with an experienced Nevada product liability attorney as soon as possible. You should be able to trust that the products you purchase are designed to be safe for normal use and when products are not safe for normal use you deserve compensation for any harm that you have suffered. 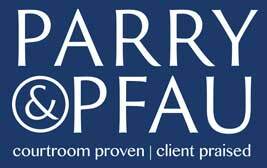 Contact the professionals at Parry & Pfau to schedule a free initial consultation to discuss your concerns about your defective product claim. Newer PostIs an Electronic Signature (E-Signature) on a Contract Valid in Nevada? Older PostWhat are the Rules of the Game for Sports Injury Liability?